"There are many unusual things in this world. Every day, events occur that cannot be explained. Bizarre phenomena that often go unnoticed because people close their eyes to what they don't understand. But the truth of the matter is, there are many unusual things in things in this world. And People.... People are the most mysterious of them all." 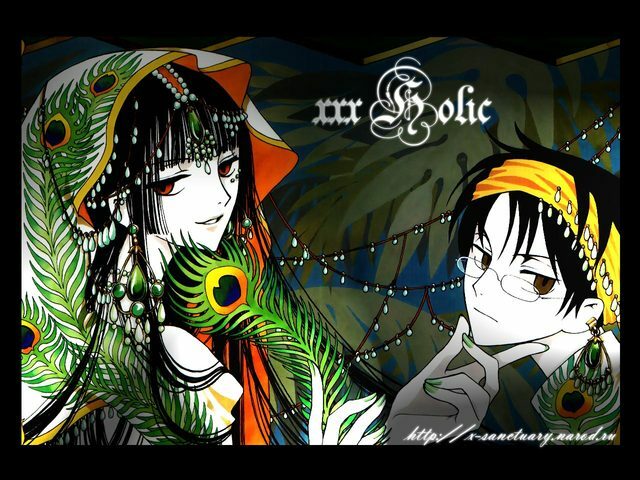 xxxHolic, a Supernatural/Comedy, is based off the manga by Clamp. The english manga is published by Del Ray Manga. The anime was produced by Production I.G. and is licensed by Funimation, having twenty four episodes. A spin off anime called xxxHolic: Kei is produced by Production I.G. as well and has thirteen episodes. This series has not been licensed in America yet. Kimihiro Watanuki, a high school student, is plagued by yokai and ayakashi, spirits with a strong attraction to him. The spirits are invisible to others and encounters with them are extremely troublesome. When he stumbles into a shop that grants wishes, however, events in his life promise to become more unusual. The shop is owned by Yuko Ichihara, a mysterious witch of many names and esoteric renown. For a price, she offers to grant Watanuki's wish to be rid of the spirits. The price, according to Yuko, must be of equal value and so, as payment, he temporarily becomes Yuko's part-time employee. Watanuki's job consists of small errands dealing with the supernatural and household chores. His love interest, Himawari Kunogi, and "rival", Shizuka Domeki, occasionally join him in his work as per Yuko's request. The three become increasingly close despite Watanuki's annoyance with Domeki. Although Watanuki becomes happy with the new friendships he makes, he becomes concerned about Yuko, promising he will try and grant her wish. This looks fairly well done with nice animation, however, this anime suffer from what I like to call "lazy animation syndrome". There are points where the animation and the look are as if the animators decided to cheat a bit or slack off with the series, and it shows on occasion. The style of the show, in some ways, reminds me of a Romance/Drama style. You can get it from the overall look, the music, and how the characters are portrayed. The story doesn't quite have a distinct plot. You would think the plot was Watanuki trying to get his wish granted by Yuko, but it's actually mentioned very rarely throughout the series. Of course it's brought up a lot in the first episode, but then, I think, it's only talked about once in another episode; but only briefly. So, instead, there isn't a consistent plot; just one more mistake that didn't quite occur in the minds of the oriducers. And the last episode of this series is literally labeled: "Side Story: Reminiscence". Yeah...... I'm going to correct myself a little bit....... THERE IS NO PLOT!!!! It's pretty much a bait and switch here. You watch the first episode and think "This is gonna be a pretty awesome story. I might enjoy this", and then you keep watching it..... And watching it......... And watching it............. And watching it.................... And watching it..................... AND THERE IS NO STORY!!!! That is just a complete disappointment for people who want a story, who want a plot, who want.... SOMETHING to happen!! I know what you're thinking, "What else is she about to say that will destroy my hopes in ever watching xxxHolic?" And, well, I can actually say that there are some pretty good redeeming qualities in this anime. Obviously, the look of the show is pretty and also can be dark at times. The use of color and design is used well and that is very noticeable. The other redeeming quality is the cast. For a show that doesn't have a real story to it, the English cast balances it out with enjoyable characters and some actual character development. A couple to certainly mention are Todd Haberkorn as Watanuki (Soul Eater, Baccano!) and Colleenn Clinkenbeard as Yuko (One Piece, Trinity Blood). And, just like in Paranoia Agent, Carrie Savage seem to have some fun playing little Mokona. What is it with Carrie Savage and playing rather cute and very interesting characters?